As mayor of Cleveland, USA Today credited him with “turning the nation’s 22nd largest city from a laughingstock in the 1970s into a three-time All-America City winner during the 1980s” after Cleveland became the first major city to declare bankruptcy since the Depression. His work rebuilding the city through public-private partnerships earned him praise from the National Urban Coalition, which hailed him as one of four distinguished urban mayors in America. Over the last decade, Senator Voinovich has also been actively involved in crafting America’s foreign and national security policies. He used his status as a five-year member of the Senate Foreign Relations Committee to conduct oversight of U.S. foreign policy in the most critical parts of the world, including Iraq, Afghanistan, Iran, North Korea, the Balkans and former Captive Nations in Eastern Europe. 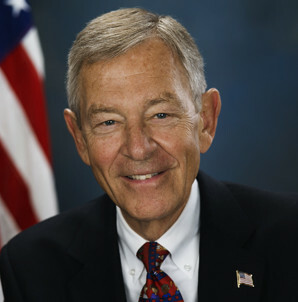 Senator Voinovich played a leadership role in strengthening and enlarging the North Atlantic Treaty Organization (NATO) Alliance and was the only member of Congress in the room at the 2002 NATO summit in Prague where membership was formally extended to Latvia, Bulgaria, Estonia, Lithuania, Romania, Slovakia and Slovenia. Senator Voinovich has also carried the banners of advancing U.N. reform, strengthening U.S. public diplomacy, promoting lasting peace and stability in Southeast Europe, and combating global anti-Semitism, racism and other forms of intolerance. And, his Visa Waiver Program legislation was eagerly adopted, and is now benefiting countries that support the United States and are committed to fighting terrorism around the globe. With all Sen. Voinovich has accomplished, he calls Janet, his wife of 47 years, God’s greatest blessing on him.